Two Ohio communities got a little “greener” last week. Thanks to the writing assignments I have for my job at Davey Tree, I know that fall is a good time to plant new trees. But I also have the Tree to thank for two back-to-back traveling opportunities I had last week. On Monday, a coworker of mine and I drove up to East Cleveland to witness a ceremonial fruit tree planting at the McGregor Home. 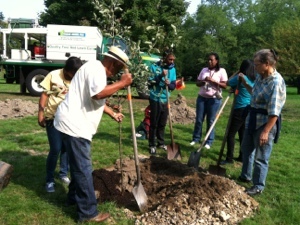 The nursing home won a grant through Edy’s Fruit Bars Communities Take Root program to receive a new fruit tree orchard. Because McGregor is located within a “food desert,” the new orchard will provide area residents with easy access to fresh, local produce. Davey donated fertilizer and mulch for the trees, which will most likely begin producing fruit as early as next year. 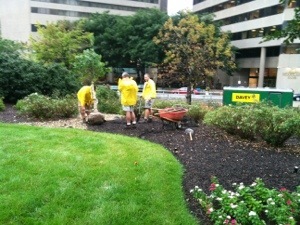 It was great to see so many volunteers involved with the plantings. I even met the program’s chief arborist, from the Fruit Tree Planting Foundation, who shared stories about similar plantings he has assisted with in Africa, Brazil and even Alaska. Before I left, a woman who is a resident at McGregor walked up to me and shared her excitement about the new orchard. She wasn’t able to physically help with the plantings, but I could tell she simply enjoyed being present while the volunteers planted the trees. That afternoon, Elaine and I hit the road for Columbus to attend Keep Ohio Beautiful’s National Planting Day event at the Ohio Statehouse on Tuesday. Although the weather didn’t hold up that day, the rain clouds cleared up later in the morning to allow Keep Ohio Beautiful and Tolles Career and Technical Center volunteers to plant some perennials the Davey Nursery donated. 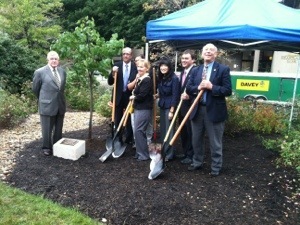 Davey also donated a redbud tree, which was the centerpiece of a ceremonial tree planting that occurred after a short presentation of speeches and remarks from a U.S. senator and Keep Ohio Beautiful board members, including a Davey Resource Group employee. The wind and rain didn’t stop the event from being successful; in fact, it was great to see so many people dedicated to such a great cause. 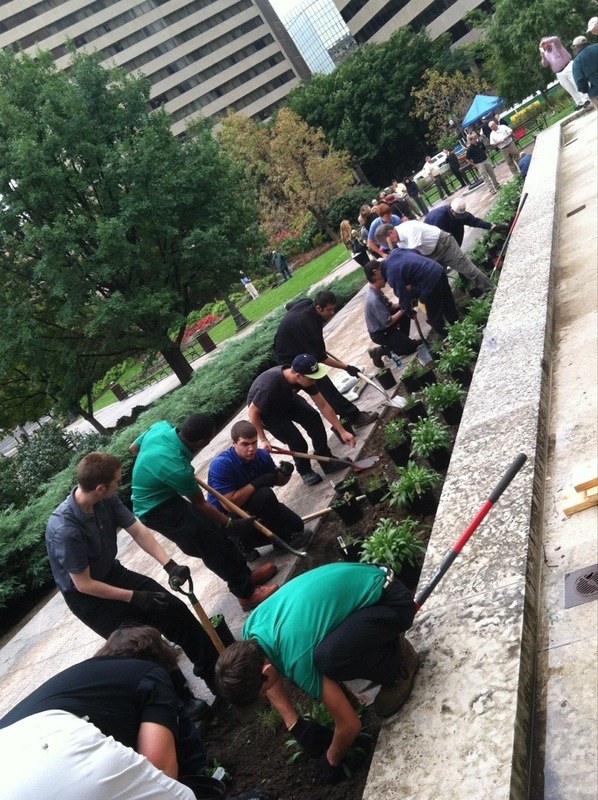 The perennials will enhance the statehouse grounds and the redbud tree will forever commemorate the purpose of National Planting Day as well as the significance of native plantings. Sometimes it simply feels good to get away from my desk and witness the responsibilities that other Davey employees have on a regular basis out in the field. And it’s also a good feeling to be part of an organization that cares about its communities.